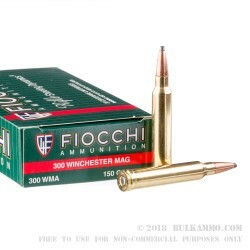 Fiocchi offers top tier factory ammunition at bargain prices and this .300 Winchester Magnum round is no exception, with the price point for competitors much higher than this new ammunition by the Italian giant. 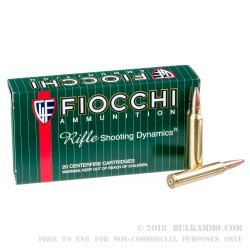 The relative performance and the top quality components along with Fiocchi;’s proven reliability and their market presence makes the load a perfect fit for hunters and target shooters who want a no-nonsense round that doesn’t have to be priced at a ridiculous level. The 150 grain soft point with a boat tail profile makes this an excellent deer, elk and moose round while still giving it the capability to take larger game, though that is a dedicated sweet spot. 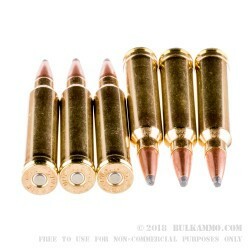 The soft point doesn’t perform as well as some of the other available bullet profiles for super long-distance wind shedding or target shooting, but for moderate and large game sized animals this will be a top choice in the lower priced end of the market. The round features a brass cartridge casing and a Boxer primer as well as premium powders to keep the follow-up shots quick and the shooting environment relatively clean. 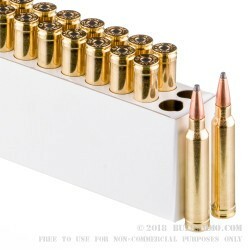 This is a 20 round box of the belted magnum cartridge.